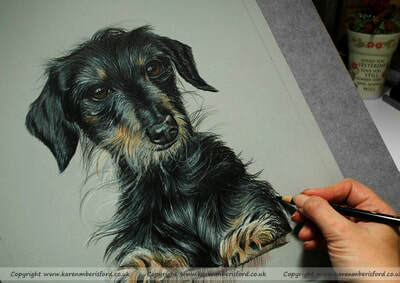 ​The Commissionee had very recently lost Zekie and asked me to produce a pencil portrait of him. It is always an honour to be asked to create a Pet portrait, especially one that means so much to someone and she did so love this little man. There were many photos of Zekie and I thought this would be a good choice as he was looking at his Mum at the time and my intention was always to reconnect them by placing a silhouette of her in Zekie's eyes, the windows to the soul. 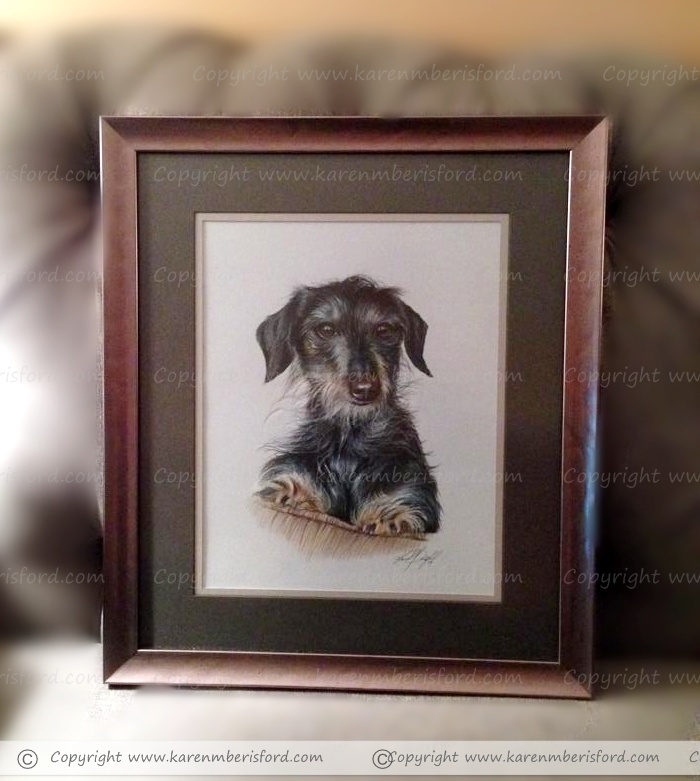 For this portrait that appeared much taller than wide, I recommended an irregular size of 11" x 14" to ensure a full body portrait would fit comfortably. 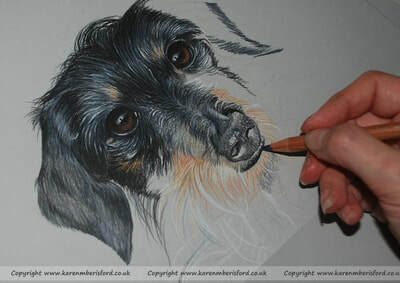 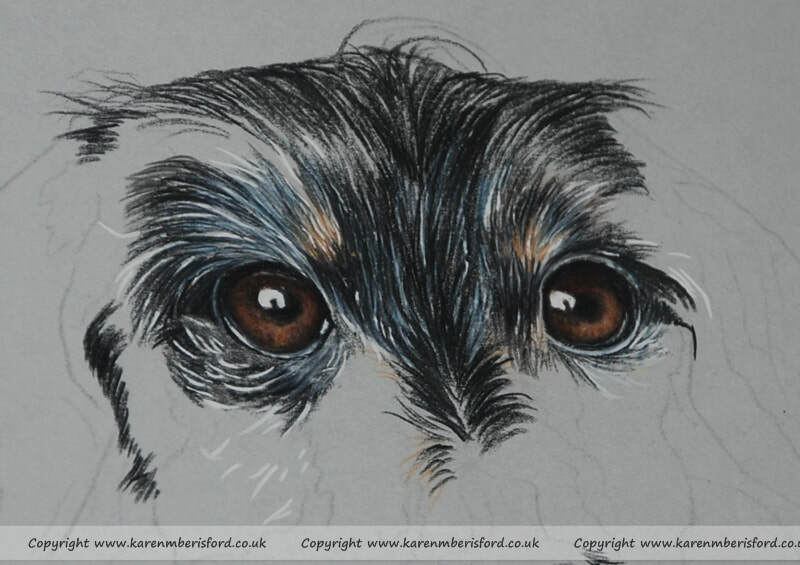 There was very little need for changes on this portrait although there was a blue cast on his fur that needed neutralising and lots of light in his eyes, which I also opted to adapt by placing the silhouette of his Mum in them. Using photographs of Zekie that had been taken outdoors, I was able to create a more natural colouration and chose to place a neutral colour on the sofa cover that his feet were placed on to avoid distraction. 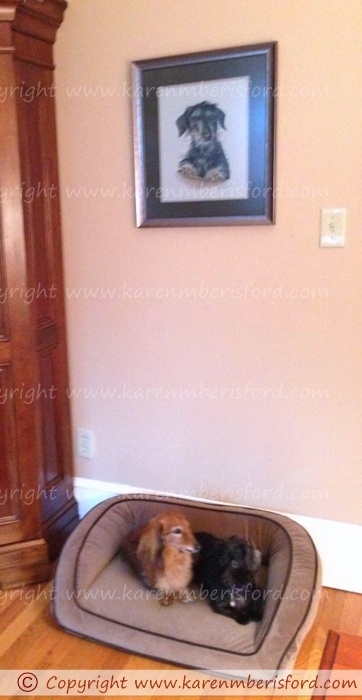 Placed above the spot where he used to sleep with his brother Samson, and the new girl Miss Molly. 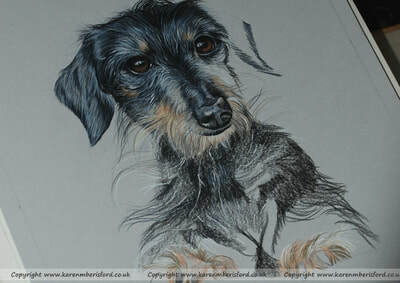 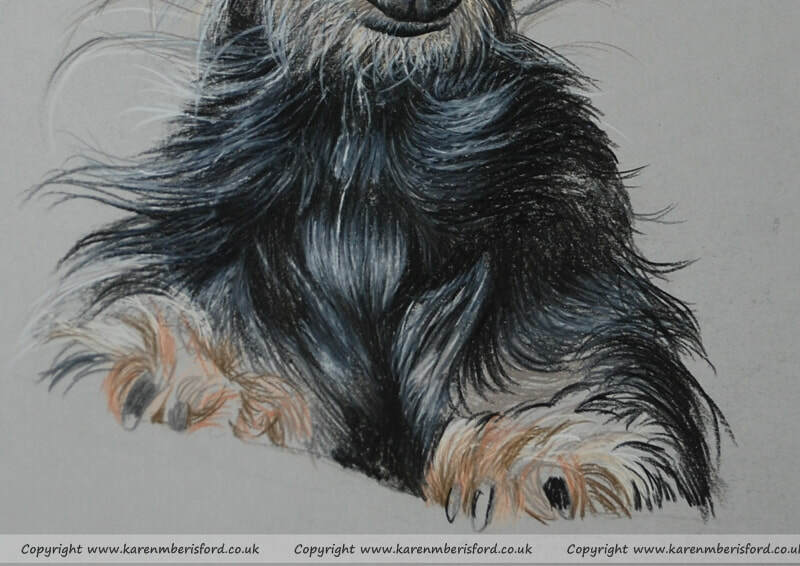 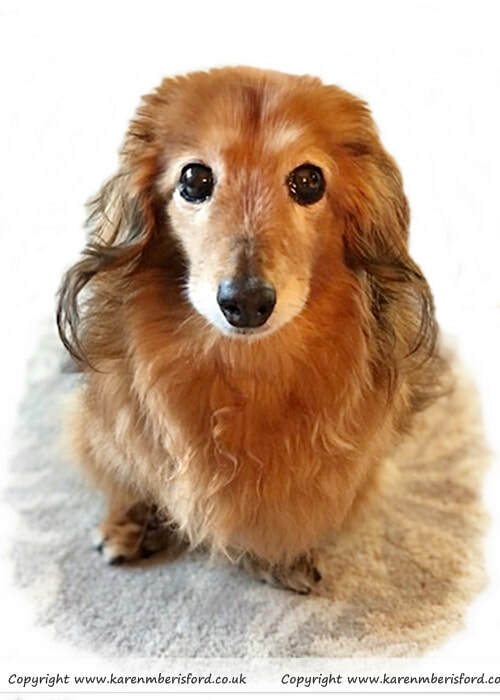 This was a second portrait that I was asked to undertake by the same Commissionee of her beautiful Dachshund Samson. 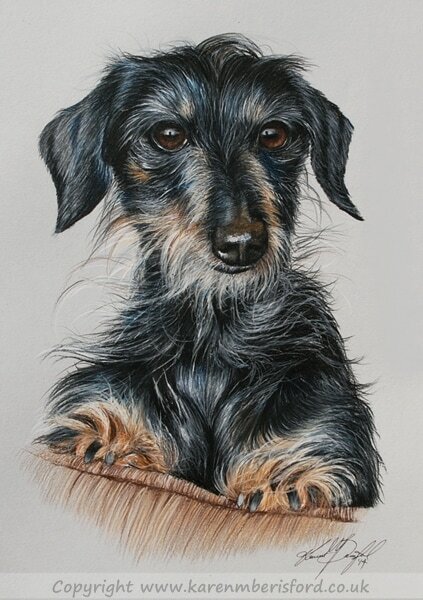 This was also completed in Coloured pencils. 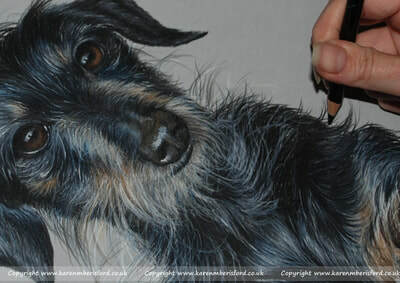 Please click on the image if you wish to view the progress of this portrait.